Save lives by meeting the most critical needs in San Diego County and investing in breakthrough research to prevent and cure breast cancer. The Susan G. Komen promise: to save lives and end breast cancer forever by empowering people, ensuring quality care for all and energizing science to find the cures. Susan G. Komen set a Bold Goal to reduce the current number of breast cancer deaths by 50 percent in the U.S. by 2026. 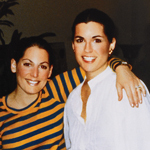 Susan G. Komen (left) with her sister Nancy Brinker. hospital, she spent her time thinking of ways to make life better for other women battling breast cancer instead of worrying about her own situation. Moved by Suzy’s compassion for others and commitment to making a difference, her sister, Nancy Brinker promised her that she would do everything in her power to end breast cancer and at the same time help women who were suffering. Though Suzy lost her battle with the disease, her legacy lives on through the work of Susan G. Komen ®, the organization Nancy started in her honor. Susan G. Komen ® is the global leader of the breast cancer movement, having invested more than $1 billion in breast cancer research since its inception in 1982. Komen’s promise is to save lives and end breast cancer forever by empowering people, ensuring quality care for all and energizing science to find the cures. Across the country, that promise is upheld by a network of local Affiliate offices. At the heart of each Affiliate is a group of people who, like Suzy, want to make a difference. In San Diego, six women a day are diagnosed with breast cancer and unfortunately one woman a day passes away from this disease. However, we know early detection and effective treatment provide the best chance of survival from breast cancer. And that’s what our work at Susan G. Komen San Diego is all about. We are the only organization that studies San Diego County to identify the gaps in breast cancer care and the barriers to health access. We created San Diego’s only Breast Health Collaborative to ensure breast health professionals work together to bridge the gaps, identify best practices and provide a unified voice about the unmet needs of San Diego County. Komen San Diego’s work is about improving the law, changing systems, removing barriers and most importantly, elevating the women and men directly impacted by breast cancer. Komen San Diego provides free mammograms, biopsies, ultrasounds, care coordination, education and financial assistance for breast cancer patients’ most critical needs during treatment. Susan G. Komen is the largest nonprofit funder of breast cancer research outside of the U.S. government. Nearly 40 percent of our research investment is focused on metastatic disease and much of that investment has been awarded to scientists in San Diego.